Sony has finally officially unveiled their virtual reality headset, codenamed Project Morpheus. As a console gamer, I’ve been jealously stealing glances at the PC-only Oculus Rift headset that’s been edging closer to consumers over the last year and am greatly relieved I’m not going to have to invest in a high-tech PC to enjoy some VR gaming. 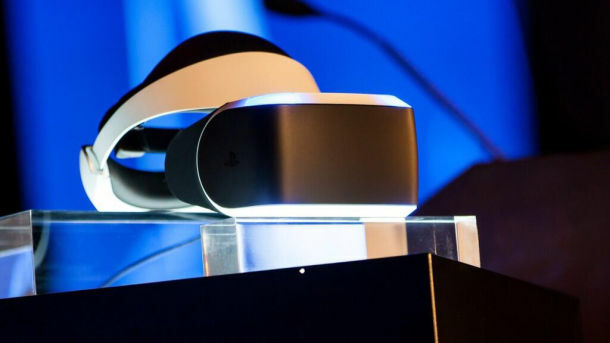 We’re still waiting on details such as price, release date and of course what games will be compatible with Project Morpheus, but that doesn’t mean we can’t have a look at some likely suspects and speculate on what else would be a good fit for Sony’s step into virtual reality gaming. With many sports titles providing excellent wish fulfilment in the form of playing for our favourite teams, winning tournaments or righting the wrongs of terrible referee choices at the weekend, playing them in first-person perspective via the Project Morpheus headset seems like a no-brainer. Even if we just get to look around a bit more via the head tracking in third-person in something like FIFA’s Be a Pro mode (you play as a single player on the field) it would feel great. But ideally, we want first-person. Perhaps an easier to fit for developers to start with though would be baseball, and with Sony’s own MLB: The Show proving to be a bestseller, this seems like an ideal sport to implement along with some PS Move controls. I’m from England and I’d play it. But not cricket, never cricket. Sorry COD, but Battlefield’s massive multiplayer scale would be insane with a VR headset thanks to the added degree of verticality the game revels in. Head tracking while flying jets and choppers would pull you in like nothing else out there. The same goes for on-foot sections where you’re constantly scanning every ledge or window for targets. You can’t expect to have full-body tracking in a game when you’re wearing a massive headset, so UFC-style games are never going to work properly with Project Morpheus. However, boxing games would require less leg movement and it’s about time someone made a proper boxing game with a motion controller in each hand. EA’s first-person mode in one of the older Fight Night games was surprisingly solid and as we know, first-person is going to be the way forward with VR. Jonathan Blow’s upcoming first person puzzle adventure is looking fantastic and the relaxed change of pace could be most welcome compared to the action-heavy games Project Morpheus may focus on. We’re going to want to sit down at some point you know. Ok, I’m getting ahead of myself with this one, but Fallout’s first-person perspective and exploratory nature that just eats away entire weekends is begging for the extra sense of immersion that Project Morpheus would offer. We just need Bethesda to admit they’re making it first though. Come on Sony; give us a reason to love the driving game you keep pulling away from us at the last minute. In-car views aren’t for everyone, but a VR headset is as close as many of us are going to get to sitting behind the wheel of a supercar. Project Morpheus’s promised head tracking would make more sense for looking out the side windows too. It sounds better than looking away from your TV for the same function with the Kinect in Forza. Outlast is pretty damn terrifying already. But imagine playing it in the complete darkness offered by donning the Project Morpheus headset. Chuck in a few electric-shock house arrest anklets to nail the feeling of getting dragged out from your hiding place under the bed and we’re onto a winner. A dirty pant-filling winner. Wait, do I actually want this? Maybe I’ll just start with FIFA. Simple introductory collections are a great way to ease us into new experiences and also handy to market the device to the more casual crowd. Just look at Wii Sports, think about how many consoles that game alone shifted. So yeah Sony, you’re going to have to bundle one with Project Morpheus. Actually, we’ll take a discounted bundle with the PS4 camera too seeing as there’s sod all reason to buy one on its own yet. Street View on Google Maps is the sort of thing that would have blown my head off if you’d tried telling me it was going to happen in my lifetime when I was a kid. So, thoroughly spoiled by modern technology, I want an on-foot VR experience of walking around famous holiday hotspots. Think Street View, but with tonnes more detail and complete uninterrupted movement rather than photos every twenty yards. Naturally, a full field-of-view range would be needed too. Come on Sony, we’ll bring the hot weather (turn the house’s heating up to the max) and you bring us that holiday. You can leave out the airport check-in loading screen experience though. I’m ridiculously excited for the next Mirror’s Edge game and have been seething with jealousy every time I saw a tech demo of the original game on the Oculus Rift. Dice’s free running classic was a little rough around the edges, but at least they attempted some innovation in the stagnating first-person genre and I’m very optimistic they’re going to nail it with the new game on PS4. Also, a VR version of free running is probably a better idea than buying some red sneakers and trying it for myself.